The first minute that I read, several months ago now, that Tiger Woods and Phil Mickelson were going to play a challenge match, with a winner-take-all purse of $9 million, my reaction was “that’s just plain disgusting.” Within the next several seconds, you can add these adjectives: cynical, unnecessary, uninteresting, disappointing. But they didn’t say that, or feel it, apparently. Two multimillionaires, past their prime, for whom a $9 million payday would be like the rest of us finding five numbers out of seven on our Lotto Max tickets, and collecting (this week) a cool $105.70. Neat! Nevertheless, the event soldiered on, and the two aging veterans – whose rivalry was mildly interesting well over a decade ago – played along with the hype, pretending that this was the Grudge Match of All Time. There have been suggestions over the last twenty years that Tiger never really had much time for Phil, and that Phil could never really quite understand why. But the two have gone out of their way over the past few seasons to make a point of showing the world that they’re really quite friendly in the locker room, and all this rivalry stuff was just so much media BS. Then they turn around and agree to face off in a match (sorry, “the Match”) designed to play up their longstanding rivalry. Pardon me while I step outside and shout “WTF? !” to the neighbourhood. So anyway, after studiously avoiding reading or watching or discussing this match (the Match), I made a point of NOT watching or caring or even looking for news of how it was all playing out. As it happened, the golf club that I belong to decided to make an evening out of the match (the Match), screening it on a TV in the bar, and inviting all testosterone-infused members and their guests to come and watch it. I had no interest, as stated. But also, as it happened, I came to the club for dinner on Friday night, with my 100-year-old mother-in-law, and we could barely hear each other talk in the dining room because of all the hootin’ and hollerin’ coming from the bar. I heard later that Phil won by sinking a four-footer. How exciting is that?! Now, to get to the point of this essay. I watched with horrified interest through all of November as fires raged in California. 84 people have died, more than 500 are still missing, thousands displaced, and more than 13,000 homes destroyed. Hundreds of thousands of kind-hearted Americans, and people around the world, including me, have sent donations to help the affected families cope. The cost of this disaster, and all the hurricanes, tornadoes, floods, earthquakes and tropical storms that are plaguing our planet in increasing volume are putting a huge financial strain on governments, and insurance companies. Not to mention the physical strain on firefighters and other responders. And yet the very rich get very richer, in part because they elect governments whose priority is to reduce taxes to make the very rich very richer. $9 million dollars won’t even put a dent in the staggering cost of damage and hardship from the California wildfires. But, jeez, it sure could help. If some cynical and greedy promoter wants to put up that kind of money so two old golf prizefighters can sashay around a course, fine. But these two old prizefighters are worth, in total, over a billion dollars, net. For Tiger, an extra $9 million might pay to have his garage cleaned. For Phil, $9 million is a bad night’s losses at the craps table. 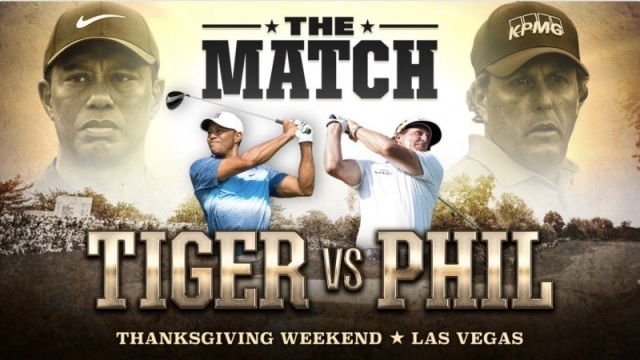 My friend Ann said before the match (the Match), and I instantly agreed, that Tiger and Phil should quietly decide that whoever wins the thing will instantly announce that the prize money will go to California fire victims, and not into their own pocket. Everyone I subsequently spoke to concurred that a gesture like that would go a long way to diminishing the cynicism of the whole exercise of the match (the Match). Not only that, it might prompt many others to open their wallets. Well, it didn’t happen that way. There was some money raised for “charity”, but I believe that money came out of the $19.95 fee that the public paid to watch. Not a penny from Tiger or Phil, that I know of. Not one word of where the $9 million will be going at the Mickelson household, except, presumably, to the casino’s treasury or to Amy’s cute little wardrobe. I’ve always been proud to be a golfer, and to support professional golf and the PGA Tour, which has directed more money for worthy causes (note I didn’t say “has given”) than I suspect any other pro sport. But I can’t say I was very proud of professional golf after this fiasco. In fact, I’m very proud I didn’t watch it. Have to agree 100% with the Gentleman from south Muskoka! It was a fake Match proven by the gimmes given during the match. Sad slap in the face to golf.